The story and history of Saint Giles. 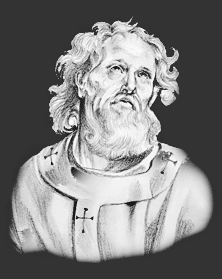 Giles, whose name has been held in great veneration for several ages in France and England, is said to have been an Athenian by birth, and of noble extraction. His extraordinary piety and learning drew the admiration of the world upon him in such a manner that it was impossible for him to enjoy in his own country that obscurity and retirement which was the chief object of his desires on earth. He therefore sailed to France, and chose a hermitage first in the open deserts near the mouth of the Rhone, afterward near the river Gard, and lastly in a forest in the diocese of Nismes. He passed many years in this close solitude, living on wild herbs or roots and water, and conversing only with God. We read in his life that he was for some time nourished with the milk of a hind in the forest, which, being pursued by hunters, fled for refuge to the Saint, who was thus discovered. The reputation of the sanctity of this holy hermit was much increased by many miracles which he wrought, and which rendered his name famous throughout all France. St. Giles was highly esteemed by the French king, but could not be prevailed upon to forsake his solitude. He, however, admitted several disciples, and settled excellent discipline in the monastery of which he was the founder, and which, in succeeding ages, became a flourishing abbey of the Benedictine Order. The Feast Day of Saint Giles is September 1. The origin of Feast Days: most saints have specially designated feast days and are associated with a specific day of the year and these are referred to as the saint's feast day. The feast days first arose from the very early Christian custom of the annual commemoration of martyrs on the dates of their deaths at the same time celebrating their birth into heaven.